Homemade doughnuts are amazingly tender. In all honesty, they can also be a major pain to make, but when you're aiming to impress, these will do the job every single time. They are a case of the homemade and the D.I.Y. standing in for the local in a most spectacular fashion. The dough for these raised doughnuts isn't terribly sweet, so the coating of sugar doesn't make them cloying at all. A mix of cinnamon and sugar or your favorite frosting or glaze would be just as tasty. Dissolve yeast in 1 cup of warm water. Let sit about 5 minutes until the yeast foams a bit (so you know it's active). Beat in 2 cups of the flour, sugar, egg, butter, and salt. Add the remaining 1 1/4 cups flour 1/4 cup at a time until the dough starts pulling away from the sides of the bowl. Cover bowl with plastic wrap or a clean kitchen towel and let sit in a warm place until the dough doubles in bulk - about 2 hours. Punch down the dough and turn it onto a floured surface. Roll dough to about 1/2-inch thick. Use a large round biscuit cutter to cut circles and a smaller round cutter to cut out the holes. Obviously, if you are lucky enough to be in possession of a doughnut cutter, go ahead and use that! Cover doughnuts (and holes) and let rise until puffy looking - about 2 hours. Heat an inch or two of oil or lard in a large heavy pot to 350 F to 375 F. Set a cooling rack over a baking sheet and put them near the pot. Put about a cup of sugar in a medium bowl and have that handy as well. Add 3 or 4 doughnuts (or 8 to 10 doughnut holes) to the oil. They should sizzle immediately as you add them to the fat. Cook doughnuts until light brown on one side. Use tongs or a slotted spoon to flip the doughnuts, cook until the second side is light brown. Transfer cooked doughnuts to cooling rack and let cool/drain for a few minutes. 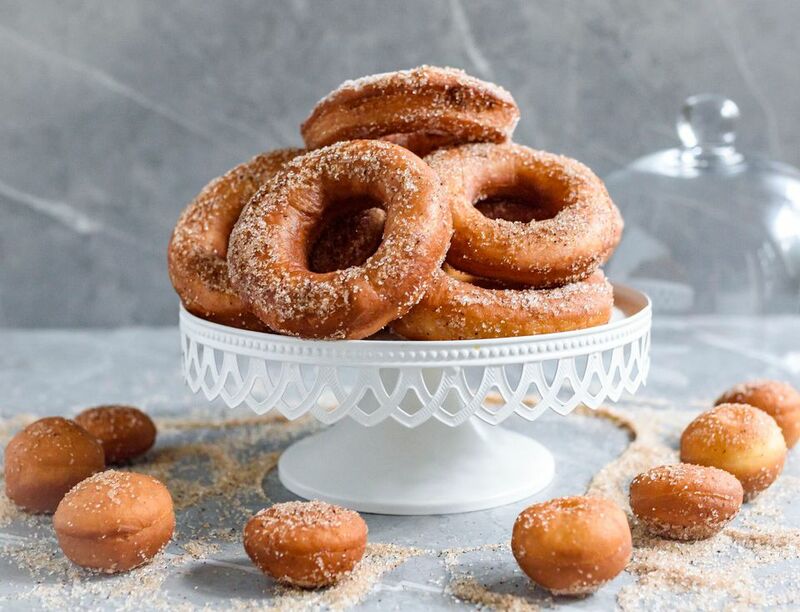 Dip doughnuts into sugar to coat. Repeat with remaining doughnuts. Serve warm if at all possible. If you'd like to make this dough ahead of time, you can skip Step 5 and chill the dough overnight before you roll it out and make the doughnuts. Or, you let the dough rise (Step 5), roll it out, and cut the doughnuts and doughnut holes out, then put the cut doughnuts and holes on floured baking sheets, cover, and chill the cut dough overnight, instead of doing the second rising (Step 9). If you don't have doughnut cutters or biscuit cutters, a drinking glass works well too.